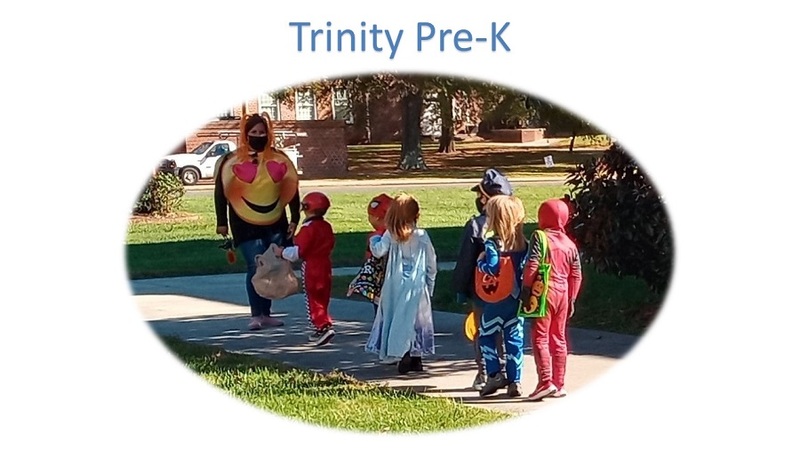 Trinity Pre-K is an educational ministry of Trinity United Methodist Church. Our enrollment is open to church members and non-church members in the community. We operate from September through May. Trinity Pre-K is a preschool that provides a great opportunity for your child to learn, grow, and develop as a whole child. Trinity's teachers provide first class teaching to each child. Classes are available for 1 year olds, 2 year olds, 3 year olds, and 4/5 year olds. A Transitional Kindergarten class is available for 4- and 5-year-old students. Our curriculum is based on leading child development standards and traditional Christian teachings. Call the church office at 704-933-1127 to set up a tour or to enroll your child. Here at Trinity, we are committed to providing a safe, caring, Christian environment for your child/children; where they can grow, learn and explore in a positive environment. Our program is developmentally and age-appropriate, where we meet the physical, intellectual, social, emotional and spiritual needs of each child. Our excellent teacher-to-child ratio allows children to explore and learn in a friendly, loving and nurturing atmosphere. Within our classrooms, teachers provide every child the tools essential for building a solid foundation of respect, love and trust. We provide continual opportunities for socialization, creative thinking, problem-solving skills, and pre-reading and math skills. Pre-K registration is now open. Click on the Dove icon on the right for additional information and the registration form. Summer Camp and Before/After School Care registrations are now open.